The Rundown: Remember back in 1999 when you went to see "Star Wars Episode I: The Phantom Menace"? You went in with these huge expectations, thinking the movie would be the greatest thing since the Ewoks battled on Endor. Turns out it wasn't. Turns it out it kinda sucked. Fast forward three years... Your standing in line for "Star Wars Episode II: Attack Of The Clones", absolutely sure that the mistakes of the first prequel will be erased with this outing and you'll look back and laugh at the early antics of Mr. Binks. Yeah... that one ended up stinking too, didn't it? 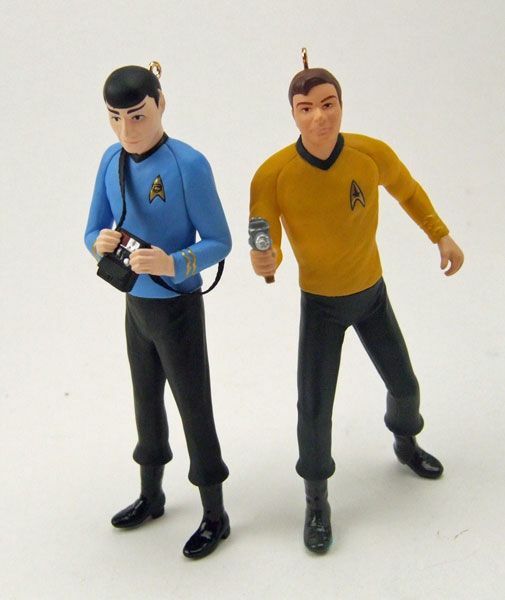 Well, that's pretty much how these 2011 Star Trek ornaments are turning out as well. Yesterday, we looked at the "Mirror, Mirror" ornament, which was kinda poopy. 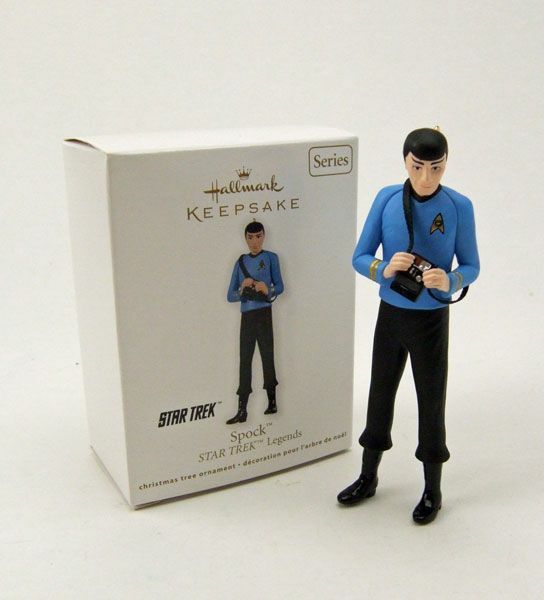 Today we turn our attention to this year's Spock ornament... which unfortunately isn't that great either. 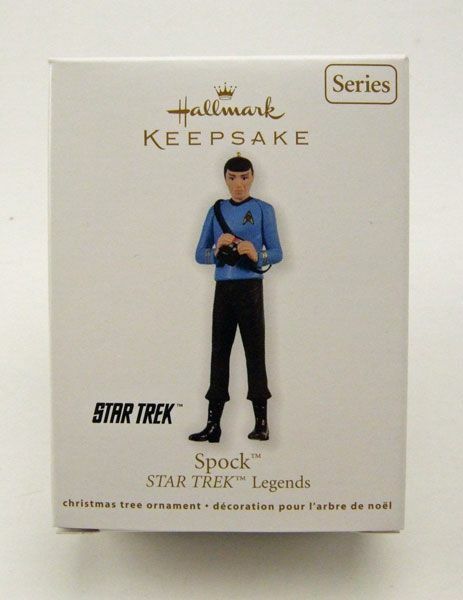 Spock is the second release in Hallmark's "Star Trek Legends" series (following last year's Captain Kirk). 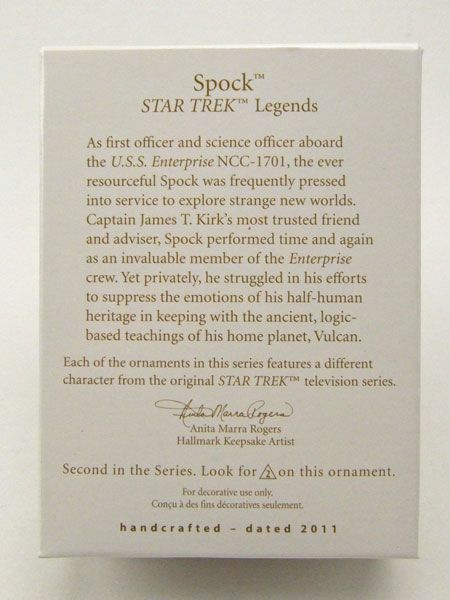 The "Legends" series is basically Hallmark's way of getting another run out of the original series mainstays, with a different character ornament slated for release each year. Like I said in the Kirk spotlight- I am all for "do-overs" on the TOS guys... but only if they do them better than the first time around. Judging by these first two "Legends", it doesn't seem like that is going to be the case with this series. ...and things start to get a little funky. And not a good kind of funky. The bad kind. What is going on with that face? Is he smiling? Is this supposed to be from "This Side Of Paradise" or something? Maybe Hallmark anticipated that your tree was going to be filled with those weird muppet-spore-plant things so they went ahead and sculpted him all happy-like. Either that or it's just not a very good sculpt. I'm going with the spore idea. The rest of the body is a contradiction in accuracy. 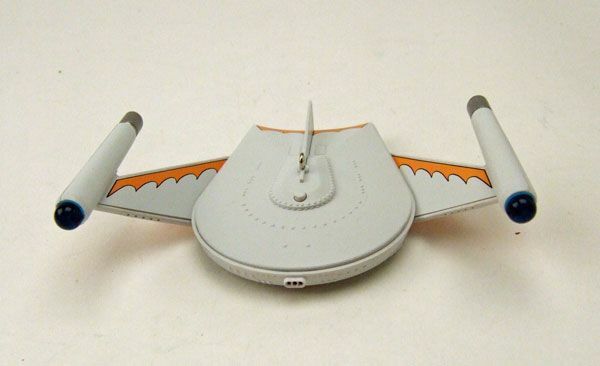 For example: The tricorder features a really odd smooshed-down sculpt, but then small details on the uniform like the rank braids and delta shield are done incredibly well. It's kinda like eating a worm and finding an apple inside. 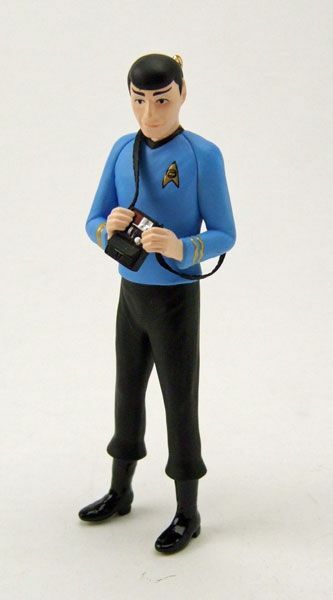 And since I mentioned it on Kirk, I feel it's necessary to bring it up here too- It's very difficult to get Spock standing without support. 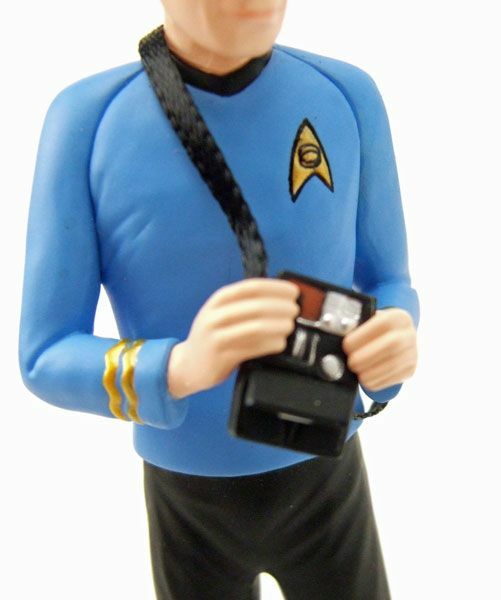 I had about 15 unusable pictures of Spock falling over when this shoot was done. 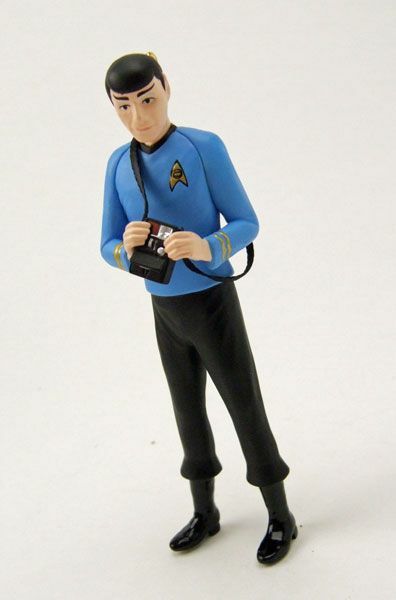 He's not nearly as unstable as Kirk, but he definitely isn't meant for displaying on a shelf. Yeah, I know he's just an ornament... 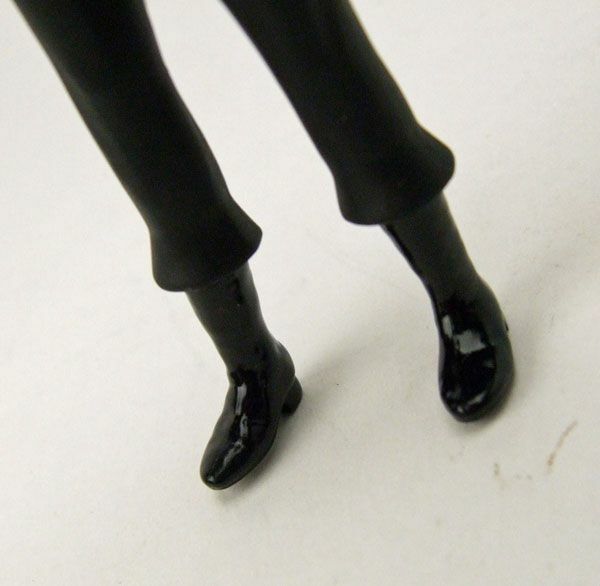 But I do like to display mine on the off-season, so his wonky feet frustrate me. 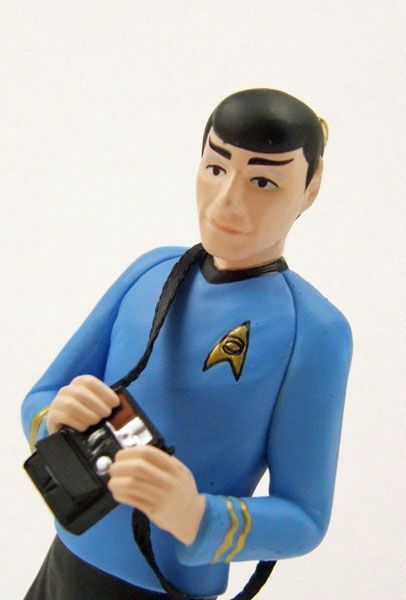 Spock looks very surprised to be featured on A Piece of the Action dot Net.